The workshops I give are usually in Dutch, but are also available in German or English. I'm planning a new workshop (of five days) in underpainting techniques. In the mornings we'll work in my studio in Amsterdam and we'll visit the Rijksmuseum, Van Gogh museum and Paintmill de Kat, where the original raw materials for making egg tempera and oil paint are produced just like there were in the time of Rembrandt. Underpainting was, for a long time, the key to achieving the impression of the lifelike 'real'. But it's also a great way to give beginning painters a kickstart. Realistic painting is a complicated thing - you actually do five or six things at a time: drawing, defining proportions, creating light and dark, handling your sense of space, defining the hue and tonality of color. With the underpainting method you do just one or two of these things at a time. A Rembrandt painting looks complicated, but becomse much easier when you know the step he took. Once you take them one by one, you'll be surprised by the things you'll make and discover. But there's more. 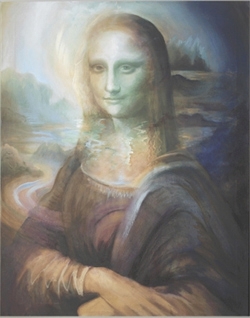 The biggest secret to underpainting techniques is the use of a contrasting undercolor. It makes the more natural and dull earth colors come to life.This is wat creates the classical realistic impression. The effect also depends on their tonality in relation to the light, space and other colors in the painting - which sounds complicated but it's just a matter of seeing. I'll tell you where to look and help you see. So, In this course we'll pay a lot of attention to the basics of painting and to perception, which is good for beginners, but also for more advanced painters who want to deepen their skills. Most art schools don't teach these techniques anymore. I re-developed them because I'm a surrealist and wanted to study perception. Interested? I'll send you more detailed information when you contact me. In the meantime, also look at my english website (pages on underpainting and the relations between color, light and darkness. Intensive painting course in Studienhaus Ruespe, Kirchundem - Germany. Arrival and departure on sunday and saturday, with five days of lessons in between. Occasionally, there will be a lecture or conversation in the evening. We'll work with two different kinds of perspective, in color and black-and-white, with an atmosphereal dry pastal crayon technique. After some introductional scetching, we'll do a pastel excercise where the two forms of perspective will be combined. Linear perspective is about an external conciousness: sharp, alert and precise, focused on the outside world. The other perspective (Iconic perspective) is about introspection, meditation and dreaming. In their interaction, you can explore the exact way your own process of perception functions. It allows you to learn to consciously create that process. If it all works out, you can have a deep experience of color this week, and a conscious experience of empathy. Intensive painting course in Studienhaus Ruespe, Kirchundem - Germany. Arrival and departure on sunday and saturday, with five days of lessons in between. Occasionally, there will be a lecture or conversation on color or art, in the evening. Intensive painting course on color, light and matter. We'll study the phenomenon 'interval color' , a phenoman about new colors that become immaterially visible as a result of optical color mixing. 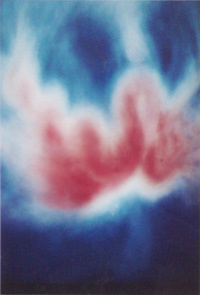 First, we'll create this effect in an atmosphereal pastel crayon technique, after that we'll work with it in a classical oil painting technique (layering). If we'll get done what I have in mind, you'll gain a skill that will inspire your work for years to come.